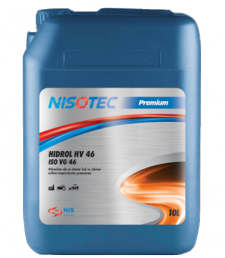 NISOTEC HIDROL HV are high quality hydraulic oils with high viscosity index (IV). Formulated with high-quality mineral oils and a stable system of additivies.The production technology is based on the latest generation additive of zinc-based additives and additives resistant to slipping to maintain oil viscosity over a wide temperature range even during prolonged use. They have a low pour point which allows them to be used in the construction, agricultural and mining mechanization throughout the year. They are also used as a hydraulic fluid in ship’s hydraulic systems.